The Weavers made a lot of live albums, a lot of them at Carnegie Hall (this was the fourth), Tso they can be difficult to tell apart, even when you're listening to one. Happily, they all share the qualities of humor, passion and good singing. 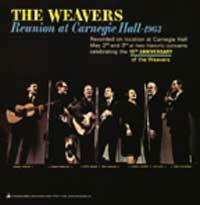 And though the Weavers broke up more than a year before this album was released, it wasn't their final record, not even their final record to be recorded live at Carnegie Hall.